A superior force where a spectator stops the magician anywhere during a running cut. Yet, that card is forced without any sleights or slip cuts. One of the cleanest card forces ever created. 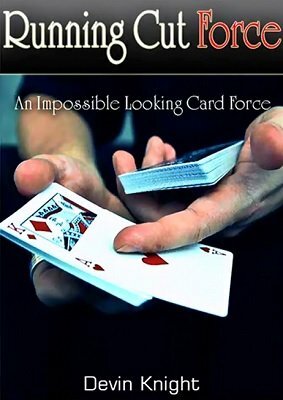 Perfect for the mentalist looking for a natural force that doesn't scream card trick. Imagine showing a regular deck of cards and repeatedly cutting them until someone tells you to stop. You very cleanly deal off the card you were stopped at and believe it or not that card was forced! Once you stop you can ask the person if he wants you to cut again. If the person says, "Yes," you cut the deck again and deal that card. Still the card is forced. One of the most natural forces ever created. No difficult sleights. Easy to do. Cut the deck until a person tells you to stop four different times, dealing each card on the table. Bam, the person has stopped you at the four aces. This is the only card force that Devin Knight uses, it flies by everyone! 1st edition 2013, runtime 5:54.